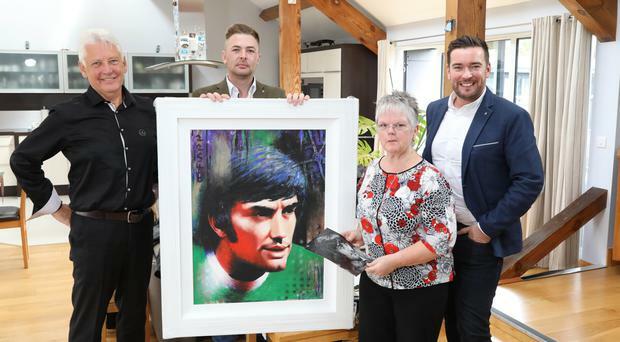 A Northern Ireland football jersey signed by Sir Alex Ferguson will be among George Best memorabilia on display at a new hotel. The £15m George Best Hotel Belfast opens in December. The Manchester United legend's sister and brother-in-law, Barbara and Norman McNarry, agreed to lend the memorabilia. Items on show will include a painting of Best; the jersey signed by Sir Alex, the first George Best Ulster Bank £5 note; items of his clothing, his book collection, awards, diaries, trophies, and previously unseen photos. Hotel general manager Damian Gilvary said he travelled to a secret location to view the items that will be on display. The £15m project is a venture between Lawrence and Katie Kenwright's Liverpool-based Signature Living Hotel Group and the family of George Best.